I was recently bit by a bug. It involved a crochet hook and lots of kitchen cotton. Hub wants to know how many potholders one house needs. Good question. This entry was posted in Uncategorized on March 26, 2010 by Jennie. Fabulous colors! You can never have too many potholders. And I love your buttons. Got one for a vest I’m making. Crochet is addictive. 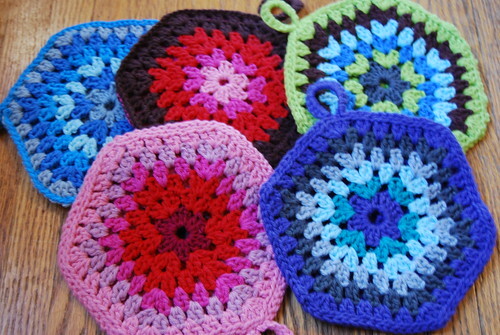 I’ve made a lot of granny squares and have no idea what I”m going to do with them.